I found this during ISO testing. It is somewhat similar to bug #701111 (marked "fix released"), except that I'm using different hardware. 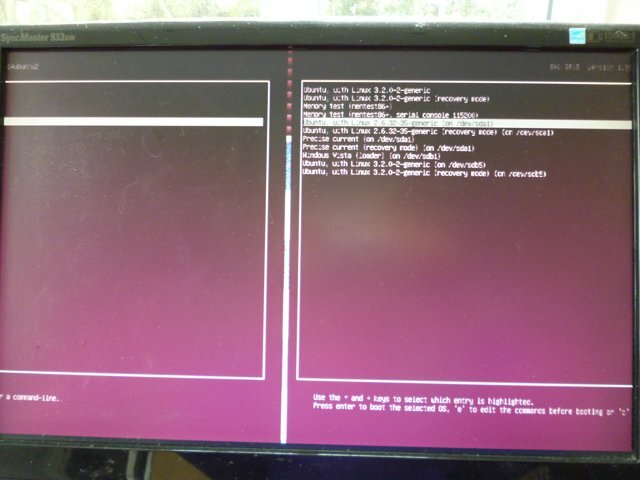 When I boot, the grub screen will appear to flash between appearing in the normal position and showing the left edge in the middle of the screen. Sometimes, it flashes backwards and forwards between the two. I've also attached a photo of the screen. 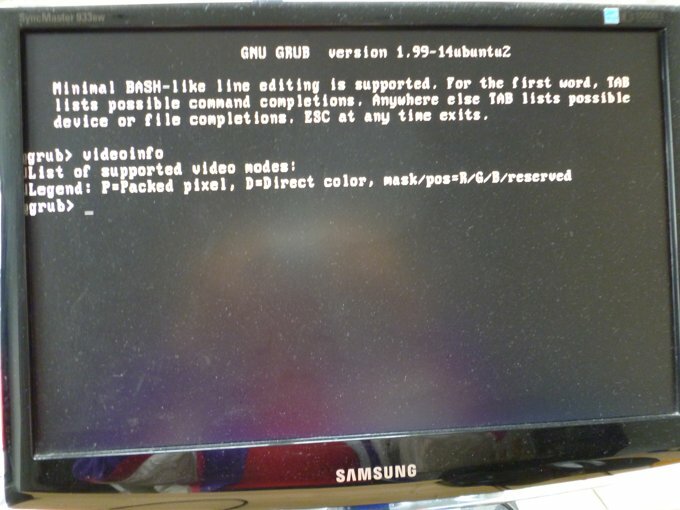 in /etc/default/grub and running "update-grub" fixes the problem, but of course renders the screen in a larger font. Have you noticed this in any other releases of Ubuntu? This bug is still present in Precise Beta1 iso candidate. 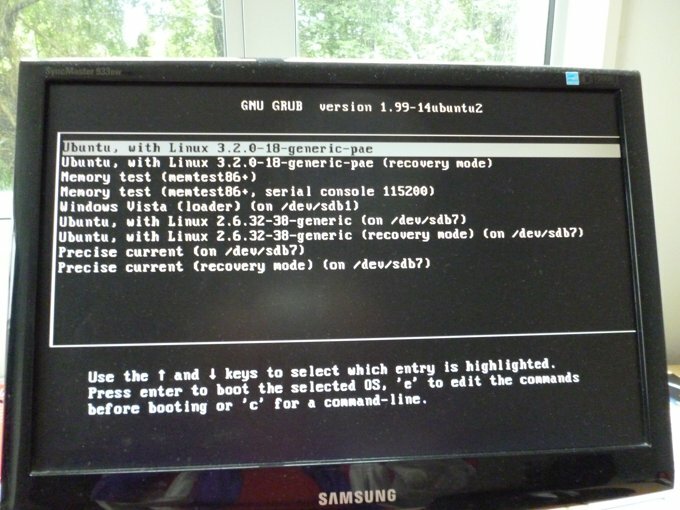 Could you run 'videoinfo' from the GRUB command line and take a photo of that? I'd like to see what mode it's selected by default. However, I think that this may have been fixed in the latest grub update. I had to run "grub-install /dev/sda" from Precise, because I have been using the Lucid grub for everyday purposes. The screen on bootup was normal. I've attached a photo of that as well. I'm not sure why the margin is missing on the right-hand side. I think it may have to do with a slight misalignment in my screen, which doesn't show when the OS is loaded. Aaahrgh! The problem is back again as of about 40 minutes ago. Some update may have been the culprit. Hm, are you sure you didn't run that 'videoinfo' command with some workaround or other in place? Ideally, it would actually be most helpful to get that output when GRUB has started with the screen in this corrupted state. I don't know what happened the last time. Any "workaround" would have been accidental. I'm finding it difficult to get a shot in which the numbers are really readable, so if any of them need to be written down and posted, I can do that. This bug is still happening in raring beta2, ubuntu-gnome.